Prepare yourself for a journey through the city by night and let your intuition be your guide. Playful Arts Sessions is an exciting evening where you can get acquainted with leading and emerging artists at the intersection of visual arts, performing arts and playful design. 13 December 7PM-10.30PM: Two playful urban explorations with international artists Aïda Gomez, Thom Kiraly and Sebastian Quack + aftertalk led by Michiel van de Weerthof (Soundtreks – Weerthof & Pagée). 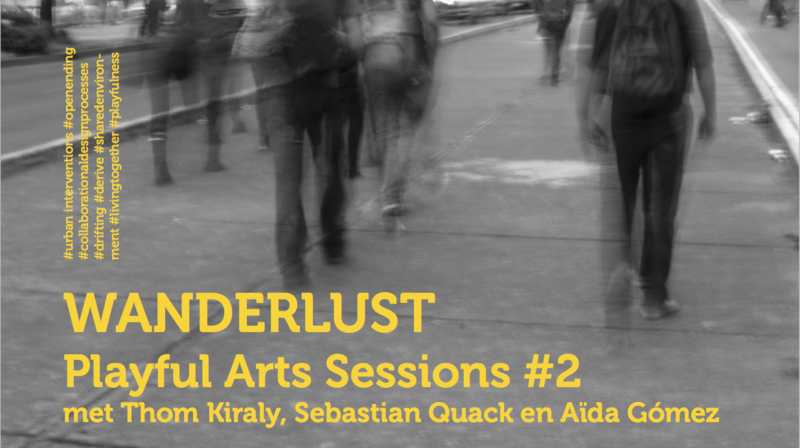 Thom Kiraly and Sebastian Quack will take you on a drift, a playful way to collaboratively explore urban landscapes on foot and take a break from everyday life. Sometimes we move slow, sometimes we move fast. The aim is to create a deep, shared experience of exploration and discovery. Guy Debord, founder of the Situationistische Internationale, introduced the drifting idea in 1956 and has inspired many artists since. Kiraly en Quack have been drifting through cities all over Europe, in all types of weather and all times of day. The second urban exploration will be guided by Aïda Gómez. Working with language games, crossword puzzles and the playful replacement of social codes in our everyday environment, Aïda Gómez finds a way of capturing and challenging the view of passersby, turning them into playfellows in her self-appointed playgrounds in the streets of Madrid and Berlin. By placing posters with word search games on billboards, weaving hearts into fences or playing Tetris with missing pieces in a subway station panelling, the artist uses simple yet subversive techniques and what she calls non-violent materials to reveal hidden treasures. * we start at Willem Twee but cannot know the exact location after that. Please be on time not to miss anything. Aïda works with language games, crossword puzzles and the playful replacement of social codes in our everyday environment. This is how she captures and challenges the view of passersby. Turning them into playfellows in her self-appointed playgrounds, in the streets of Madrid and Berlin. By placing posters with word search games on billboards, weaving hearts into fences or playing Tetris with missing pieces in a subway station panelling, Aïda uses simple yet subversive techniques and what she calls non-violent materials to reveal hidden treasures. Sebastian Quack is an artist, game designer and curator working at the intersection of play, participation and the politics of urban society. Sebastian’s work is process-based and cooperative. Sebastian is a founding member of the network Invisible Playground and curates Playpublik, an international festival for playful public spaces. He regularly teaches, gives talks and consults organizations on how to engage playfully with the world around them. Sebastian lives in Berlin. Sebastian has worked on a number of ground-breaking playful projects including Area/Code’s plundr, the world’s first location-based PC game. Notable work with Invisible Playground has included projects for Victoria & Albert Museum, HAU Theater, Oerol Festival, Metropolis Festival, Aichi Triennale, Urbane Künste Ruhr – and Turtle Wushu, a game that involves a tiny turtle sitting on your hand.One of his newest projects, Playful Commons, explores what kind of licenses administrators and users of public spaces can agree on when it comes to allowing play to take place. Usually tries to get people to play games through organizing events. He is also an occasional spoken word artist and poet. He lives in Malmö, Sweden. The evening is an initiative by Playful Arts Festival, a collaboration between playful culture curator Zuraida Buter (zo-ii) and art organization Wave of Tomorrow, based in Willem Twee. We gratefully thank the Willem Twee and the Municipality of ’s-Hertogenbosch for supporting the program.